with effect of UDAY – deficit of Rs. 17454 crore 85 lacs. Estimated Fiscal Deficit for 2018-19 Rs. 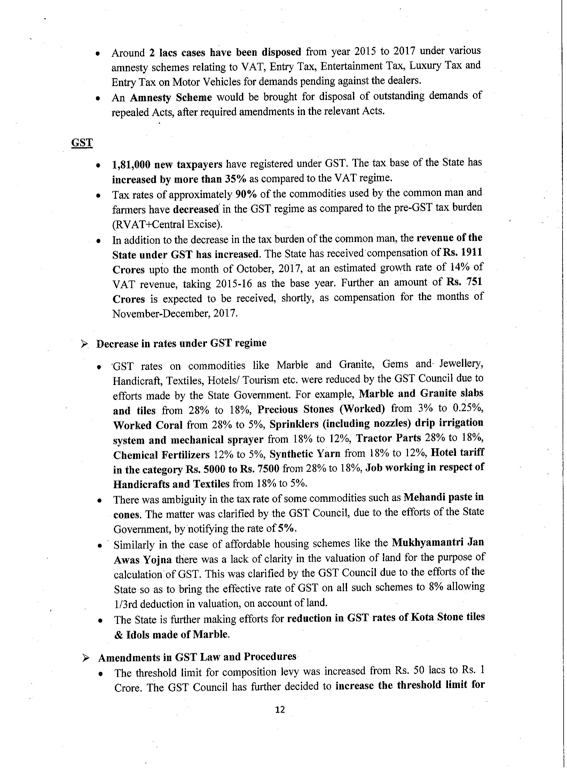 28011.21 crore which is 2.98% of GSDP. 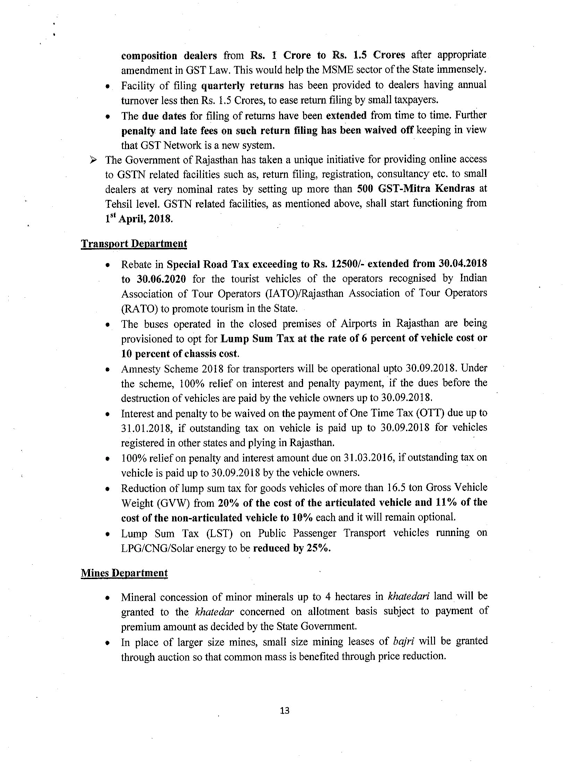 Estimated total revenue receipts for 2018-19 Rs. 151663.50 crore. Estimated interest payment in 2018-19 is Rs. 21412.62 crore which is 14.12% of total revenue receipts. Connecting remaining Gram Panchayat headquarter by constructing roads under Grammin Gaurav Path Yojana and Missing Link Yojana with provision of Rs 766 Cr. Up gradation and renewal of 5 thousand Km of Rural Roads with provision of Rs 800 Cr. Construction of 882 Km roads in district Jodhpur, Nagour and Pali under ADB and World Bank sponsored schemes with provision of Rs 2,274 Cr. Up gradation and maintenance of 3464 Km of rural roads under PMGSY with provision of Rs 1622 Cr. Construction of fully automatic driving tracks in all remaining 19 district transport offices. Development of emergency landing airstrips on selected highways/mega highways. Establishment of State Level Road security training centers in Jaipur with provision of Rs 10 Cr. Free travel in RSRTC Buses for old age people beyond 80 yrs and 50% concession for one attendant. Toilet facilities creation at 30 RSRTC Bus Stands. 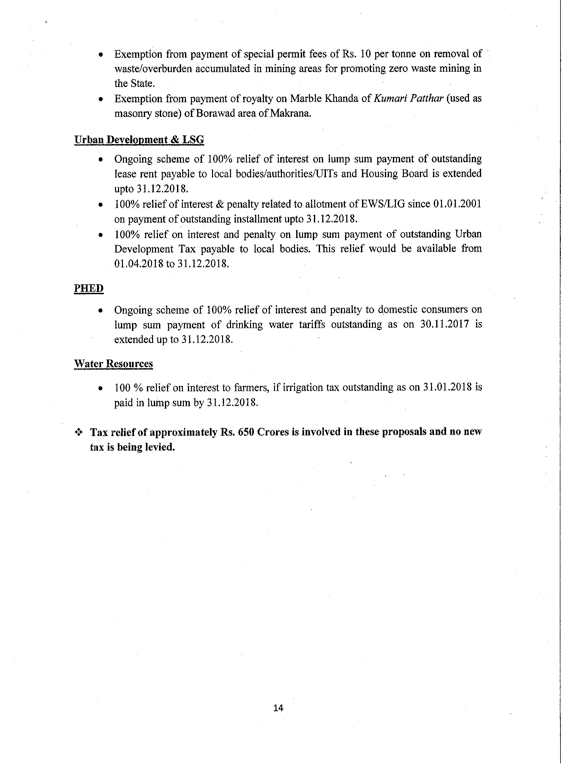 Announcement related to initiation of major irrigation and drinking water projects such as Eastern Rajasthan Canal Project, Bramini-Banas Project, Anas Dam Project in Banswara, Upper High level cannel from Mahi Dam in Banswara, recharging Jawai Dam from Sabarmati Basin project for utilization of 577 million Cubic meter water of Tajewala head, Mahi high level cannel from Jakham Dam and Drinking water project for district Udaipur and Rajsamand from Jakham and Devas Dam with estimated cost of Rs 52,000 Cr. Announcement related to incitation of JICA sponsored Rajasthan Water Sector Livelihood Improvement Project in 16 districts. World Bank sponsored Rajasthan Agricultural Competitiveness Project in 7 districts and New Development Bank sponsored Rajasthan Water Sector Re-structuring Project for Desert Area in 3 districts with provision of 1658 Cr. Beginning of Parvan and Dhoulpur lift project with provision of Rs 1150 Cr. 2 major drinking water projects under Regional Water Grid namely Mahi High Level canal to Jaisamand drinking water project and additional water treatment capacity for Bisalpur Jaipur Drinking Water Project Phase 2 with provision of Rs 1,450 Cr. .
Initiation of Parvan-Akavad drinking water project; Dungurpur-Aaspur-Dovra Major Drinking Water Project; Gararda & Jhaliji ka Barana Major Drinking Water Project, Bundi, Kachawan Drinking Water Project in Chabra, Baran for addressing scarcity of drinking water in these areas. Sanctioning upto 100 hand pumps in each constituency for handling water crisis during peak summers. Establishment of 500 new RO plants to provide safe and qualitative drinking water. 7 Lac new domestic electric connections under DDUGJY and IPDS in rural and urban areas of Rajasthan. Creation of 24 new Divisions and 93 new sub divisions in the State to improve structural formation of DISCOMs and provide better services to the consumers. Providing 2 Lac Agricultural connections to dispose of pendency upto January 2012 . Onetime Loan waiver upto Rs 50,000 for small and marginal farmers in the overdue and outstanding category of short-term crop loan provided by Co­operative Banks and constitution of Rajasthan State Farmer Debt Relief Commission. Provision of Rs 544 Cr. for providing short term crop loan and interest subvention to the farmers by Co-operative Banks. Providing interest free Loan of Rs 500 Cr. to RAJFED for procurement of mustard and gram under Minimum Support Price Scheme to assist farmers during distress. Creation of additional 5 Lakh MT storage capacity with provision of Rs 350 Cr, by Rajasthan State Ware Housing Corporation. Providing additional 10% top-up subsidy for construction of farm pond and Jal hauz with provision of Rs 20 Cr. Providing additional 25% top-up subsidy of construction of Diggis in canal areas with provision of 90 Cr. Providing subsidy up to 50% of construction cost or Rs 10 Lakh for establishment of green house and shade net with provision of Rs 32 Cr. Providing subsidy of 35% and 40% for respectively 3HP & 5HP solar energy pump system. Provision of Rs 40 Cr for advance storage of 2.25 Lakh Mt. Urea and DAP for crops. Providing subsidy for Nandi Goushala upto Rs 50 Lakh in each district of the State and increasing fodder subsidy from 90 days to 180 days. Providing infrastructure facilities for registered Goushala with the provision of 50 Cr. Subsidy of 50% of cost or maximum Rs 40 Lakh for establishment Bio-Gas plant in Goushala. Providing infrastructural support for construction of additional class rooms and toilets in Model Schools with provision of Rs 360 Cr. . Introducing fresh milk, thrice a week, for all students covered under Mid Day Meal Scheme with provision of Rs. 250 Cr. Recruitment of about 77,100 teaching staff including 54,000 III Grade Teachers to address manpower issues in remote and rural areas. Converting self financing scheme in government colleges in state financing with provision of Rs 11.41 Cr. Facilitating skill development courses in 50 government colleges to benefit over 12,000 students per annum and establishing 3 Fab Labs at Jhalawar, Bikaner and Jodhpur districts. Free Wi-Fi in government colleges and free travel facility to interview aspirants for competitive exams conducted by UPSC, RPSC etc. Provision of Rs 15 Cr for Entrepreneurship Development under Skill Training Scheme. Transforming 27 District Employment Offices as Model Career Centers with provision of Rs 45 Cr. Women wing in 12 trades under 24 Government ITls for strengthening technical education in the state, particularly for women. Announcing 8 new ITIs in the state and extending smart class room facility to all District ITIs and Directorate, Jodhpur and Commissioner Office, Jaipur. Announcing youth icon scheme by facilitating Shri Kamlesh Nagarkoti on his outstanding performance by an award of Rs 25 Lakh. Infrastructure, furnishing and sports facility support to SMS Jaipur by sparing Rs 6.50 Cr. 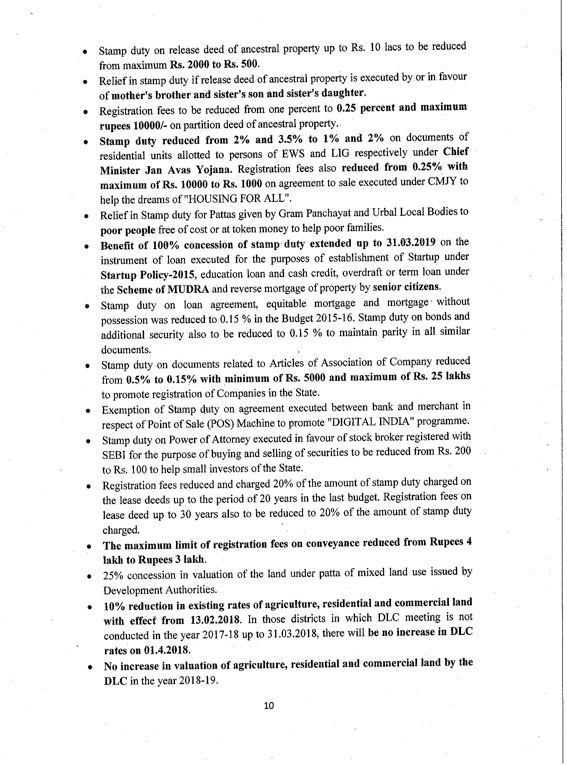 Outstanding loan and interest upto 2 lacs to be waived of by RSCSTFCC- burden on ? 114 crore. New Ambedkar Bhawan in each Municipality area-provision of? 80 crore. Interest free loan of ? 2 lacs to people engaged in occupations like Plumber, Cobbler, Riclcshawala etc. Bhairon Singh Shekhawat Antyoday Swarojgar Yojna announced, loan upto ? 50 thousand to 50 thousand families at 4% interest without collateral. Solar lamps to 170660 farmers of tribal sub-plan area. Facilities available to Sahariya and Kathodi of tribal sub plan area will be provided to ‘khairwas’ also. Free distribution of 8 lacs seed minikits to SC, Non SC BPL and Antyodaya farmers of tribal sub plan area of Pratapgarh, Udaipur, Dungarpur, Sirohi and Kishanganj and Shahbad Tehsils of Baran- Expenditure of ? 14 crore Announcement of 1000 new Ma-Bari Kendra with gas connection – 30000 children will be benefited, provision of? 36 crore per year. Construction of 10 new residential schools and 1 hostel under Dev Narain Scheme. Announcement for EBC Welfare:­- Sundar Singh Bhandari EBC Swarojgar Yojna announced, loan upto ? 50 thousand to 50 thousand families at 4% interest without collateral. Scooty to total 200 girls securing more than 85% in 10th Board and to 200-200 girls (total 600) securing more than 85% in each of Science, Arts, Commerce subjects in 12th Board. Benefit of Anuprati Yojna for securing 85% in last examination. Benefit of pre-matric and post matric scholarship-Exp. of ? 273.50 crore. Providing Bhamashah Surksha Kawach with accidental insurance of upto ? 1 lac to the members of Bhamashah Card holder NFSA families-4.50 crore beneficiaries. New Divyang Kosh for welfare of specially-abled – provision of? 1 crore Subsidy of ? 1 lac to Adult orphans leaving govt, orphanage and joining mainstream society. Multi purpose hostel at Dungarpur, Pratapgarh and Banswara for girls preparing for competitive exams-provision of? 12 crore. Construction of 2 hostels in Gobind Guru Tribal University, Banswara – Budget of ? 8 crore. Construction of 12 Anicuts and 6 canals in tribal area-expenditure of? 20 crore 25 community lift irrigation projects in tribal areas. Maximum two years childcare leave ■*’ Payment of arrears of 7th Pay Commission from 01.04.2018. Recruitment for total 1.8 lac posts. Providing Annapurna Rasoi facility in each Distt. Collector Office premises. Increase in cash amount to ? 25 lac to the dependants of martyrs. Construction of Shahid Smaraks at all remaining district headquarters.- ? 20 lac each. Increase in mess allowance New 210 vehicles to police force-exp. of? 7.10 lac ->i Recruitment of 1161 constables for new MBC battalion -h ? 164 crore for construction of residential and administrative buildings. New ADR centre building in Jaipur- 10.81 crore. Exp. of 33.25 crore on conservation of 19 monuments . 10 crore for development of different temples. 10 crore for six new panoramas. 7 crores for museum at Mangarh Dham . Recruitment of 500 forester and 2000 forest guards. Stage wise implementation of pollution control and management system. Insurance scheme for personal equipments of photo journalists and news cameramen. Interest subsidy for house construction to journalists. Financial aid to the dependents of Journalists and sahityakar having incurable disease. 1000 additional Bhamashah ATMs in rural areas. 250 e-mitra plus in urban areas. Implementation building plan proposals on 3D BIM base in 4 smart cities. ‘The Trader Welfare Board’ would be constituted for speedy disposal of problems related to dealers, their social security and insurance needs and for making suggestions on Acts/Rules etc. ‘Trader Welfare Fund’ would also be created with initial corpus of Rs. 10 Crore. After the implementation of GST from 1st July, 2017, VAT and CST based subsidies would now be based on These subsidies would be directly transferred to bank accounts of the entrepreneurs. 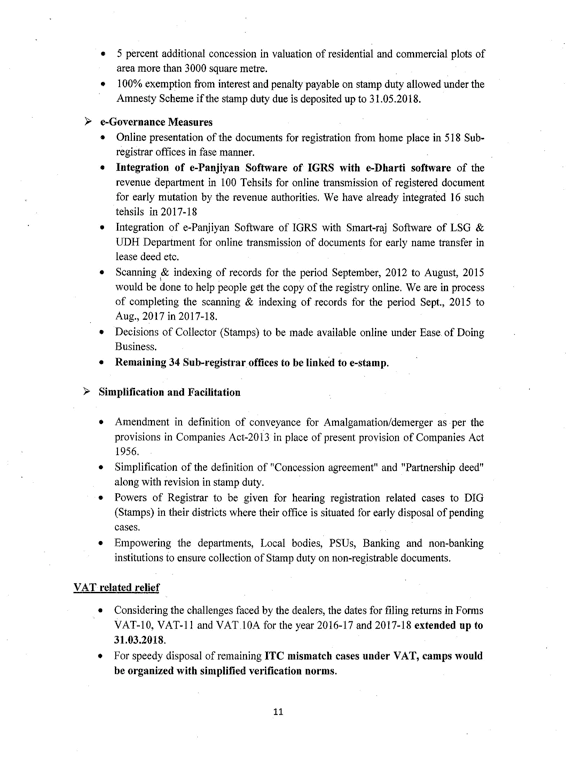 Exemption from Entertainment Tax and Luxury Tax was available under RIPS during VAT regime. These sectors would be considered for SGST based subsidies. To promote employment to bonafide resident of Rajasthan, employment subsidy is enhanced by Rs. 5000 for these persons in each category. Subsidy in most backward area and backward areas would be enhanced from Rs. 40,000 and Rs. 35,000 to Rs. 45,000 and Rs. 40,000 category wise. For establishment of IT, Entertainment and Tourism sector units 50% exemption would be available from Stamp Duty payable on purchase/lease of a floor/space in multi-storeyed commercial buildings. Operative period of RIPS-2010 and RIPS-2014 would be extended to 31.03.2020 and 31.03.2021 respectively. SGST based investment subsidy under RIPS would be increased from 30% to 40%. Sick units under MSME sectors to get relief in payment of arrears of SGST in 24 installments. Sick units under MSME sector would be allowed 100% exemption from payment of Electricity Duty for one year from the date of rehabilitation package. Reimbursement of guarantee fee upto Rs. 1 Lac under Credit Guarantee Trust for Micro and Small Enterprises (CGTMSE) for the MSME sector. 50% reimbursement of fees, upto Rs. 10 lacs for Technology acquisition from national level accredited institutions. 50% reimbursement upto Rs. 5 lacs on purchase of equipments for obtaining at least Silver Category under Zero Defect and Zero Effect (ZED) scheme of Government of India. 75% reimbursement of expenses incurred for Energy Audit/Water Audit/Safety Audit subject to maximum of Rs. 1 lac for each such audit. 25 % reimbursement upto Rs, 10,000 for credit rating under Performance & Credit Rating Scheme of Ministry ofMSME, Government of India. To promote Agro based industries and services, the maximum limit of interest subsidy in a year is increased from Rs. 5 lacs to Rs. 5 lacs per year. 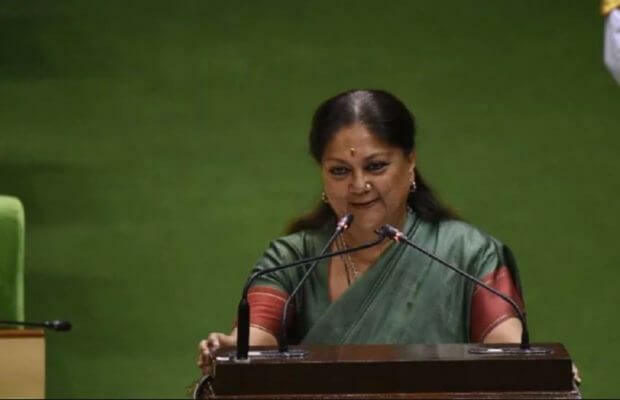 Interest subsidy for women, disabled, SC/ST and entrepreneurs, who are bonafide residents of Rajasthan and are of age upto 40 years is enhanced from 5% to 6%. To promote self entrepreneurship for bonafide residents of TSP area in Agro Processing Sc Agri Marketing sector, for the notified manufacturing and processing activities under RIPS-2014, 5% interest subsidy will be provided on bank loans upto Rs. 20 lacs in addition to the benefits already available. For improving the quality of agriculture produce activities such as cleaning, trimming, grading etc. would get incentives under RIPS-2014 at all stages of supply chain. For supporting the ‘Operation Green’ of Government of India related to perishable produce like tomato, onion, potato etc., benefits to Reefer Van (Cold chain) are proposed under RIPS-2014. Infrastructure support subsidy with the maximum limit of Rs. 5 Crores is proposed for first unit established in most backward area investing more than Rs. 50 Crores under each sector of Agro Processing and Agri Marketing, Bio Technology and IT sector. Ongoing Scheme for waiver of interest payable on the outstanding installment due towards all categories of land allotment in colonisation areas is extended upto 31.12.2018. In order to provide big relief to farmers, ‘lagan’ on land (land revenue) would be exempted from (kharif samvat 2075) Financial Year 2018-19. This would benefit almost 40 to 50 lacs farmers. Use of agriculture land for non-agriculture purposes in rural areas can be regularised on payment of penalty equal to 1.5 times of conversion charges upto 31.12.2018, instead of four times of the conversion charges. In rural areas, valuation of the agriculture land up to 1000 sq. meter be done at the rate of agriculture land instead of the rate of residential land to help farmers to sell or buy the land for agriculture purposes in rural areas.